There was, in fact, a 1967 film called “The Redwoods” which won the Academy Award for Documentary Short Subject in 1968. Here’s a link to some info about the producer, Mark Jonathan Harris, in which it states, “The Redwoods, a documentary made for the Sierra Club to help establish a redwood national park that won an Oscar for Best Short Documentary.” It appears he is, or was, a film professor at USC. This link, to Mr. Harris’ web site, has a picture of the cover and information about seeing the film via Phoenix Learning Group. Hi Bill, As I wrote in the e-mail I sent you at 6:16 pm, thank you for reading, commenting and for the research. CONGRATULATIONS! I haven’t verified or followed all the links yet, but it looks like you win. That was pretty fast. I imagined that someone with the right set of skills or a lot of determination could find out pretty quickly. I wonder what is up with the cover…? The bottom photograph of the three looks like it might be one of Dad’s, at least it resembles one of his. It looks like the black and white version of “Sun Through Giant Forest, Del Norte Coast Redwoods State Park” but that doesn’t fit with what Dad told me and what I remember. It is puzzling. I remember seeing the advertisement for the film when I was a kid and it was Dad’s “Alder And Redwoods In Fog, Humboldt Redwoods State Park, 1962,” not “Sun Through Giant Forest.” As far as I know, he was the first landscape photographer to photograph directly into the sun. He photographed into the sun in the forest, over the ocean in 1949, reflecting off of a river in 1956 and reflecting off of a lake in 1951. It was sort of his little invention, as far as I know. I will write the director of the film and find out what photograph was on the cover and in the poster when the film was originally released. Thank you for your participation. Your own website looks interesting too. I’ll post more updates here and write you as well. The above shows film title and link to site for purchase. I’ve confirmed from IMDBPro everything summarized above by Wikipedia. This info is also confirmed in a result of a database search at the Motion Pictures Academy website. How should I proceed? You see I’m trying hard here. I also leave the country soon. Don’t you want to buy the video? I think this must be it! Hi Vicki, thank you for sending me the e-mails starting at 6:37 pm last night about the NY Times article you discovered that mentioned “The Last Redwoods,” Dad’s book. You were hot on the trail. You did a lot of research and I appreciate it. The first film you mentioned, “The Spirit of America,” I don’t believe is about Redwoods. However, after a bit more digging you did get the correct 1967 film, “The Redwoods,” in your comment above at 12:13 am today, or this morning or tonight or whatever. Thank you also for attending my talk at the Colorado Environmental Film Festival. It was mind-blowing that you were the only person in the room that had heard of Edward Abbey at an Environmental Film Festival. It was impressive though that one guy knew who Stuart Udall was. He’s more obscure in many circles. You would think they would know Edward Abbey…? Thanks again, great to connect with another Abbey fan. It is just dawning on me that many people probably have no idea what a Monkey Wrencher even is. I mention it as the theme of my blog in the upper right. Times have changed. Yet, it is strange because Edward Abbey’s following and readership are growing. A major influence in building public and congressional support for the creation of Redwoods National Park, this award-winning film calls attention to the impending doom of California’s magnificent redwoods which are being logged at a rate of three million a decade. Through the narration of an old logger, viewers are moved to consider the environmental value of these magnificent trees which date back to the age of the dinosaur. Produced by the Sierra Club. Hi Vicki, glad you enjoyed the treasure hunt. I enjoyed getting your messages when I came home this evening. I went back down to the festival to see “Butterflies and Bulldozers” produced by Steve Dunsky who did a section of a film on Dad in the 1980s and made one of the best still portraits of Dad yet, with his view camera and a communion with nature look on his face. It is the last photograph in the “Non Portfolio Prints Available” portfolio on the main Philip Hyde website: http://www.philiphyde.com/#mi=2&pt=1&pi=10000&s=31&p=9&a=0&at=0 I’ll probably do a blog post on Steve Dunsky one of these days when I get caught up with the backlog of posts I have lined up. I am familiar with Redwood City. I have a friend who used to live near the software company Oracle. My mother’s family had a cabin in South Lake Tahoe and my uncle still has it. I agree, you ought to hang “Alder And Redwoods In The Fog” at your place in Tahoe, but as long as you are hanging real art, perhaps you would like to have a bigger one than 11X14…? That photograph is gorgeous as a 20X24. We don’t print most of the black and white digital prints any larger because the original raw file was Creo scanned from a Philip Hyde print rather than the negative. Anyway, we’ll talk… Thanks again for your participation. There will be more updates here after I contact the producer or cinematographer as you suggest. Hey, that’s great! Thanks very much. I wasn’t around when the film came out, but I like a good challenge. And the print possibility just made it too good to pass up! I agree that the bottom photo looks most like the one you posted, but perhaps flipped horizontally? Or maybe it was a different image altogether? The other thing I considered was that perhaps the cover on the video/DVD was of newer vintage than the original promotional materials. It looks like maybe Mr. Harris is fairly reachable via his web site (this page, from USC, even has his email and phone number: http://cinema.usc.edu/faculty/harris-mark.htm , and I’d hope he’d be happy to speak to you about a film that won him his first Oscar! Perhaps he even has more information about your father’s connection to the effort. Hi Bill, thank you for your research efforts. That sounds like one of the best ways to find out more. It’s great that both the producer and the cinematographer are still around. He’ll probably know about the original promotional photograph. The bottom photo is not “Alder And Redwoods In The Fog, Prairie Creek” but it might be the black and white version of “Sun Through Giant Forest, Del Norte,” which doesn’t make sense, unless Dad mixed it up, which I highly doubt if you knew my dad. I would think they might change the cover of the film at least once in 43 years. I will post here what either you or I find out. CONGRATULATIONS ON YOUR WIN. 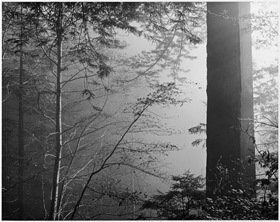 As soon as we have confirmed whether or not “Alder And Redwoods In The Fog, Prairie Creek, 1962” was indeed the original promotional photograph for the documentary that won the Academy Award, you get to browse through http://www.philiphyde.com/ and decide which one you want as an 11X14 print. You will win whether “Alder And Redwoods In The Fog, Prairie Creek, 1962” was the photograph or not, but I want to at least chase down the leads before awarding the prize in case I need more help. Hi Bill, other contestants and other dear readers, SUCCESS!!!! The mystery of the Academy Award winning documentary “The Redwoods,” has been solved, with thanks to you, Bill Sawalich, CONTEST WINNER, for providing the contact information and name of the film. I heard from the producer, Mark Jonathan Harris. Mr. Harris sent me the jpeg of the original film cover. It turns out it is Dad’s photograph. As soon as I opened his jpeg, I saw right away it was the image I remember seeing as a kid. Apparently I am the one who mixed up the two photographs recently. They have very similar names. The one depicted on the film cover was, “Fog, Redwood Forest, Prairie Creek Redwoods State Park” and the one that I put in this blog post above is “Alder, Redwoods, Fog, Prairie Creek Redwoods State Park.” I will hopefully soon write another blog post showing both landscapes and the promotional cover of the Academy Award winning film.